The research and investment that goes into selecting a diamond can be compared to the exhilarating experience of acquiring fine art. The ability to view, wear and enjoy a beautiful gem each day parallels the veneration of a Chagall or Matisse with the additional benefit that historically there will be accumulated escalation in value. As with all major purchases much like real estate, automobiles and fine art, acquiring the fundamentals of the subject at hand will help to avoid the many pitfalls which will invariably turn up. My overview, as a Graduate Gemologist and veteran jeweler will confidently provide the information necessary to make an informed and careful purchase. Most of us are familiar with carat weight, clarity and color grades. We will summarize those attributes, focusing on the round brilliant diamond and then concentrate on more subtle aspects such as cut grade, finish grade, symmetry and fluorescence. A review of diamond certification will round out the buying guide. In selecting a diamond, the first question that should be asked, with disregard for all the technical jargon is: Is the diamond face up gorgeous and stunning? A balanced amount of white light and spectral colors should emanate from the gem with a scintillating interplay of reflective flashes from the individual facets. In examining and appraising many diamonds over the years I have come across examples which have had close to flawless clarity grades combined with high-color grades (i.e. VVS1, E) and noted that the diamonds had very little visual life to them. The reason for this is that the diamonds were cut shallow, (a window stone) or deep, (dark in the center) or the arrangement and positioning of facets degraded the interplay of light. All these factors head up under cutting grade, which in my opinion is the elemental dynamic of a fine diamond. Our first item to evaluate will be carat weight. Carat weight is exactly that; a weight rather than a measurement. The word “carat” originates from the Greek name for carob or locust tree. The weight of one average dried carob seed was used as a unit of measurement in gem trading. Its actual modern counterpart would be 1/5th gram or 200 milligrams. In pricing diamonds, decimal fractions of carat weights such as .25ct. .50ct., .75ct., offer specific price windows per carat which change with each uptick in the fraction. With two diamonds of equal clarity and color in hand, one weighting .99ct. and one weighing 1.00ct., the .99ct. diamond will be substantially less expensive then the full one carat diamond. This can be an advantage to the individual who desires the size of a 2.00ct. Diamond but is willing to accept a 1.99ct. Diamond of equal quality and apparent size for a reduced price. Our next category, clarity grades require careful consideration when shopping for a diamond. Clarity grades refer to the number, position and size of inclusions which interrupt the free flow of light in a faceted diamond. Most inclusions are actually additional diamond crystals within the host crystal yet there are more than twenty-four different minerals which may make up additional crystal inclusions. Top grades begin at internally flawless to VVS1–VVS2 (very-very slightly imperfect), VS1–VS2 (very slightly imperfect), and SI1–SI2 (slightly imperfect) I1-I2-I3 imperfect. For practical purposes all clarity grades from internally flawless to VS2 will visually look the same with the unaided eye. Slight inclusions will only be visible with a 10 power loop or microscope. For this reason, unless investment grade diamonds are desired, a diamond of VS1 or VS2 clarity grade is an excellent choice. 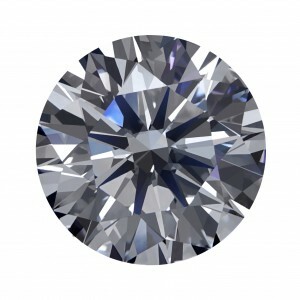 A grade of SI1 can also be a beautiful if the inclusions are both light in color and distributed towards the outside perimeter of the diamond where they are less visible. If one considers the full production of diamond mining, only the top 20% will be of clarity grades high enough for jewelry purposes. Of that 20% only the top one or two percent of diamonds will be of the flawless/near flawless categories. This mathematical reality is the reason that an internally flawless 1.00ct diamond of D color will at current prices sell for over $20,000. In contrast a diamond weighing 1.00ct. With numerous large inclusions (I2-I3) might sell for $1,000 or less. The rest of production will be used for manufacturing/drilling purposes. Considering the long term financial outlook, it is best to consider a higher clarity diamond for rarity, resale and trade-up purposes. Color grading relates to the inherent body color which a diamond possesses. Diamonds naturally appear in an array of colors with Red and Blue being the rarest, but for our purposes here we will refer to diamonds beginning with colorless to slightly yellow. A diamond of fine color within this context will mean a diamond with absence of color! The color grading system begins with the letter D, no color, to Z, fancy yellow. The first grouping of letters including D-E-F are considered colorless and do not have any visual discernable body color. The next group is G-H-I-J and is near colorless followed by K-L-M, which have a slight yellow cast. Most of the diamonds sold on the market will be fall into these color groupings. As in clarity grading, diamonds without noticeable body color are rarer then diamonds with a slight amount of yellow or brown body color. When evaluating a diamond, take into account that the first five letter grades of D through G will afford a diamond of excellent mirror like qualities when other grading factors are held to the same higher bar. Diamonds with grades of J or lower will tend to visually look as if there was a thin coat of interceding wax which slightly lowers a full resplendent reflection of white and spectral light. My own personal choice of color grades would be E or F color. There is the benefit of obtaining both a colorless gem and the better pricing compared to a top D grade. It should be notated that diamonds are difficult to color grade even by a trained gemologist without master comparison sets. It is also true that mounted diamonds may have the appearance of being of higher or lower color depending on the type of the metal utilized (platinum, yellow & white gold) and the method of setting, such as prong, bezel, pave or burnish type. With our terminology at hand, we can now look at the interaction between clarity and color grades with respect to the pricing and the overall beauty of the diamond. If you had two diamonds to choose from, one which was graded VVS1 clarity with J color and the other diamond was VS2 and G color and both were the same price, which diamond would you choose? Answer: VS2, G. the VS2 G will be the finer quality diamond based on a the higher color characteristic coupled with a visually eye-clean diamond. The VVS1-J will be free of almost all inclusions yet have a slight yellow body color. To summarize, in this instance, the color grade supersedes the clarity grade in significance. To continue with the major evaluating criteria of the modern brilliant diamond, we will turn to the cut grade which is of crucial magnitude in selecting a diamond. Until just recently, it was usually overlooked, even by jewelers. The modern brilliant ideal cut diamond was first described in 1919 by Marcel Tolkowsky an engineer by training and member of a Belgium diamond cutting family. He studied the refractive index of diamonds, (the way light is bent as it travels through the gem) and came up with the cutting angles that would best return the maximum and most balanced amount of light in a round brilliant diamond. Most of the diamonds cut since then did not follow his parameters. By circumventing the best cutting angles as described by Tolkowsky, diamond cutters were able to fashion heavier and larger diameter (i.e. –more expensive ) diamonds but consequently sacrificing brilliance and beauty and in some cases durability. This method of diamond cutting resulted in saving more carat weight from the original rough diamond with the resulting higher profits. Fortunately with a modern emphasis on quality and higher standards, the cut grade has become prevalent. It is only recently that both the Gemological Institute of America (GIA) and the American Gem Society (AGS) diamond grading labs began evaluating cut grade on certificates. With the American Gem Society, the best cutting grade available is rated “0.” with higher digits signifying a lower level of cut grade. The AGS cut grade refers to the cumulative average of the diamonds light performance, proportion factors and finish. GIA’s diamond grading certificate has cut grade ratings of excellent, very good and good as pertains to cut, polish and symmetry. With either one of these diamond grading certificates a customer can evaluate the quality of a diamonds overall brilliance. Cut grade also encompasses attributes such as polish lines, pits, misalignment of facets, off-center table, naturals, extra facets, wavy girdle (perimeter), misshapen facets and many other variations of a diamonds which effect the magnificence of a round brilliant diamond. Our concluding and sometimes underestimated feature of diamond grading is fluorescence. Fluorescence refers to luminescence (emission of light) which is activated by invisible radiation such as ultraviolet light. Fluorescence is present in approximately 65% of gem quality diamonds and will be noted on any of the diamond certs as negligible to strong fluorescence. A diamonds fluorescence is visible when exposed to sunlight or a black light causing the diamond to emit colors which may appear blue to purple with more rare overtones of green, pink and yellow. These additional colors will mask the true body color a diamond, even a “D”. Generally if a diamond is noted as being “negligible” or “faint” fluorescence, the overall effect on the diamond will be minimal. With a medium to strong fluorescence grade the effect can be detrimental to the overall beauty of the diamond and as a result should significantly decrease the cost and value of the diamond. In summary, the true value of a round brilliant diamond will be a combination of many different natural occurring and human influenced factors. The skill of a diamond cutter can add value to a medium to fine clarity and color diamond by bringing out the best in proportions, polish and symmetry.